This page will provide you with information about laparoscopic nissen fundoplication. For further details, please speak to your consultant. When stomach acid moves up into your oesophagus or gullet it causes a condition called acid reflux. This is caused by a fault in the valve that links your stomach and oesophagus. Sensing acid in the back of your throat or experiencing symptoms like heartburn are a sign of acid reflux (see figure 1). 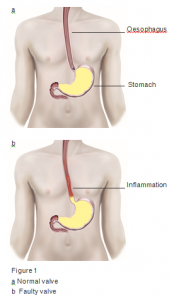 Surgery is the most effective way to put an end to recurring and long-term symptoms caused by acid reflux. Symptoms can often be controlled with medicines that soothe inflammation so surgery is generally only recommended if the condition becomes persistent. A general anaesthetic will be administered so you will be asleep throughout. You can expect the procedure to take one to two hours. The surgeon will create a few tiny incisions in the abdominal region and surgical tools will be inserted to perform the operation. One of these instruments will be a telescopic device that allows the surgeon to monitor the procedure on a video screen. To reduce the size of the opening that the oesophagus passes through, stitches will be applied to the diaphragm and the top of the stomach will be wrapped and stitched around the oesophagus to create a new valve. The incisions will then be closed with stitches. You can expect to leave the hospital the following day but it can take three to four weeks to return to work and your normal activities. Seek advice from your consultant for your specific situation and line of work. Exercise can help the recovery process but ensure you speak to a healthcare professional before attempting this. Symptoms like heartburn or acid in the throat indicate acid reflux. This can damage or cause discomfort in the oesophagus. If medication does not help, surgery is recommended to alleviate symptoms and prevent damage.